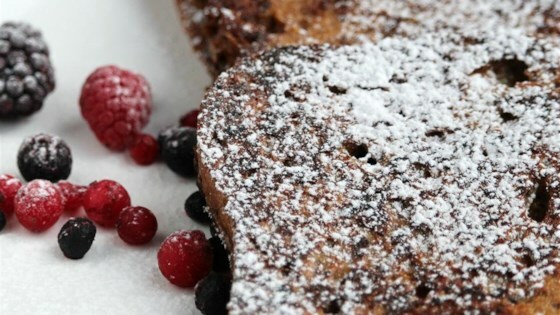 "An easy-to-make gingerbread-flavored French toast that gives you that warm, fuzzy holiday feeling. Serve with butter and syrup or brown sugar." Whisk milk, eggs, sugar, rum extract, salt, cinnamon, nutmeg, cloves, and ginger together in a bowl. Dip each bread slice into the egg mixture, turning to coat both sides. Melt butter in a non-stick skillet over medium heat. Add bread slices in a single layer and cook until golden brown, about 3 minutes per side. Top bread with more cinnamon, nutmeg, and clove to serve, if desired. Vegetable oil or cooking spray can be substituted for the butter. Vanilla extract can be substituted for rum extract. Wheat bread can be substituted for the white bread, if desired. This can also be cooked in an electric skillet. Easy and my family loved them. Didn't change anything to the recipe except just added a dash of salt instead of the amount it called for. Great recipe! Fun to make, smells and tastes incredible, and my family loved it. Wow! This was very nice. Great for those winter mornings. Thank you for the recipe.